I hope everyone had a wonderful Mother's Day. It's a beautiful day today, the sun is shining, and the dandelions are thriving. My dear husband went out and bought me one of those new weeders by Fiskars, and boy, does it ever make weeding easier on the old body! I've been trying to do a little weeding every day, but it seems never ending this year. I did spend some time in my work room yesterday, and drew out the designs for the setting triangles in my new "Vintage Tiles" quilt. No pictures to show yet, but at least it's progress. I've put the pixie quilt aside for now, as I was "stuck", and just couldn't settle on a design for the surround. I'll try to get back to it soon. It's my daughters birthday tomorrow, so I've been busy baking her cake, and getting the icing made. I also had to run the vacuum around the house, as the loose threads were taking over. At least the place will be respectable for company. Since I've nothing new to show you, I'm posting a photo of another of my designs. 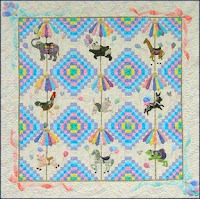 This one is called "A Carousel Menagerie" and was designed in 2003, and published in 2004. I had fun with the embellishing on this one, using swarovski crystals, beads, silk ribbon an threads and Ultra Suede. The colors are brighter than I normally work with but I was trying to challenge myself. Hope everyone has a great weekend. Talk to you later.